There is no question the geniuses at Pixar Animation Studios understand stories better than anyone. From that first groundbreaking foray into the adventures of Woody and Buzz in Toy Story (1995), to the comedic heights of Finding Nemo (2003), the ingeniousness of The Incredibles (2004), and the wondrous vistas of WALL-E (2008), these guys have never made movies only for children. They know that adults were once children too, and the films they make work beautifully on both levels. 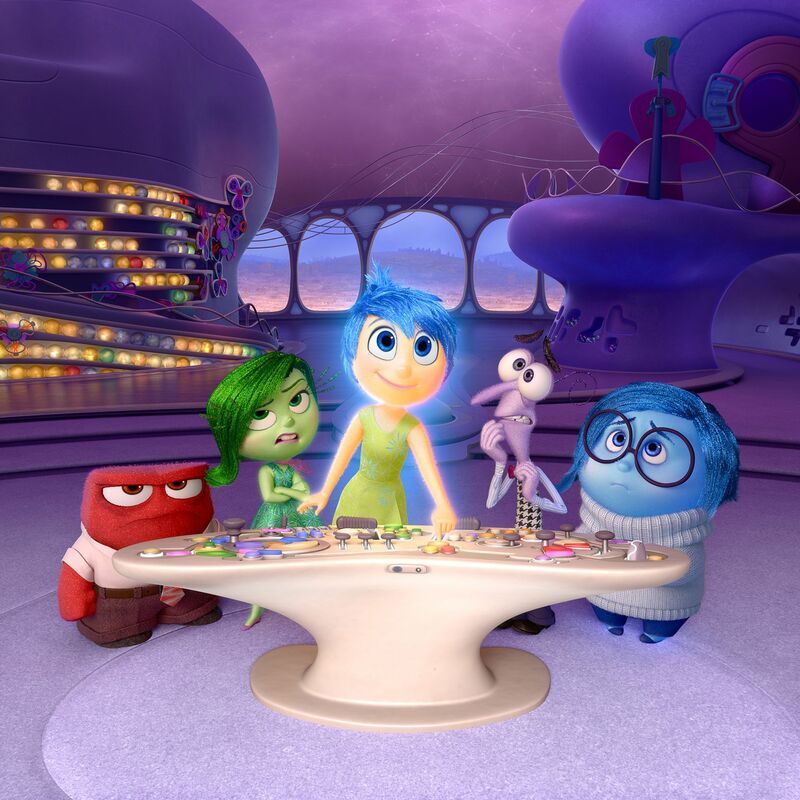 It’s twenty years later and Pixar once again hits the emotional jackpot with Inside Out, a movie that in theory should not work but does so in delightful and unexpected ways. The story is about an eleven-year-old girl named Riley who relocates to San Francisco with her mom and dad, an experience that triggers all sorts of strange feelings in her. But the film is really about what goes on in her mind – literally – as we are introduced to the five personifications of Riley’s emotions: Joy, Sadness, Fear, Anger, and Disgust. This team has been in control of Riley’s reactions since she was a baby, and now face the unlikely task of sorting out the complex wave of responses that are triggered in her as she tries to adapt to a new home, new school, and new friends. Plus, how can this city put broccoli on its pizza? Setting a whole film inside the brain would seem like too abstract a concept for junior viewers, and it is. Inside Out creates an intricate world out of Riley’s gray matter, complete with areas for subconscious fears and compartmentalized memories. As Riley gets deeper into a depression, the five emotions must figure out how to help her, learning along the way that true happiness comes from their very own intrinsic balance, and in particular a healthy relationship between Joy (voiced by Amy Pohler) and Sadness (Phyllis Smith). It’s pretty heady stuff (pardon the pun), and perhaps the most serious of all of Pixar’s films to date. Whereas WALL-E had concerns about Earth and the environment, and Up (2009) addressed issues of loss and acceptance, both those films also had heavy doses of action and humor, which made them more accessible to kids. Inside Out is fun, but it has loftier goals in mind: This is a movie about family, honesty, and responsibility, about the special bonds between parents and their children, about the fleeting yet fantastic bliss of being alive. Cherishing the very act of growing up is no easy feat to do without stepping all over cheap sentimentality, but directors Pete Docter and Ronnie del Carmen pull it off perfectly. Inside Out is full of marvelous set pieces: Floating islands that represent a person’s personality; a shortcut through Abstract Thought that turns Joy, Sadness, and Riley’s imaginary friend Bing Bong into cubist shapes; a Train of Thought that’s really a train; clever references to Vertigo (1958) and Chinatown (1974). The list is endless. One thing is for sure, though: Just as there can be no joy without a little sadness, our lives would be pretty miserable without a little Pixar.